The summers and post few days after it, remind me of the days we used to rush back from school waiting to dig into our lunch. Some days when the noses twitched looking at lesser favorite veggie on the plate, pop came out this small bowl of instant pickle. The feeling of chewing into the raw mangoes sprinkled with salt and paprika was famously packed into this little bowl with a bit more tang and sweet dosage. 1) In a pan heat the oil. Add the mustard seeds. 2) When it crackles, add the asafoetida. 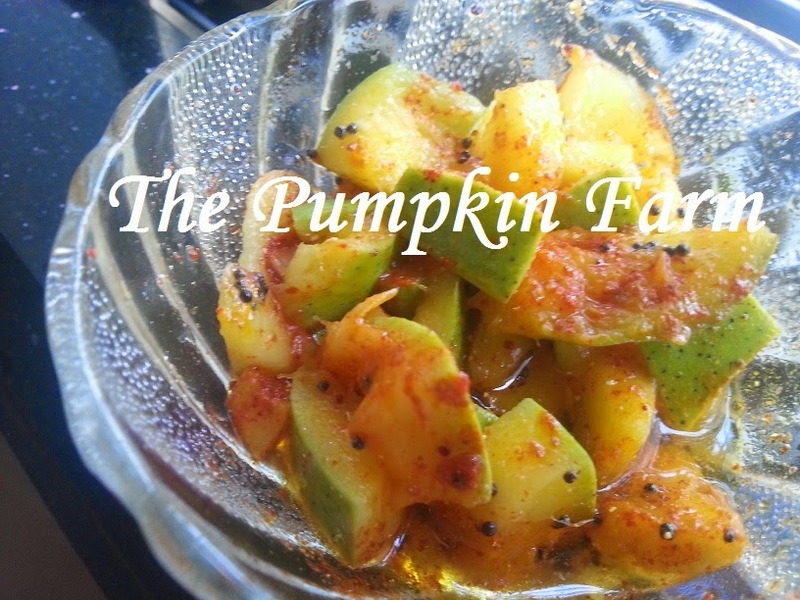 2) In a bowl, mix the mango, red chilli, salt, sugar, turmeric . 3) Pour the tempering on top and quickly stir. Your instant tangy pickle is ready. This stays well for a 3-4 days when refrigerated. I love instant pickles. .they are fresh and give a strange satisfaction. .good one. Wow wow..I too love all instant pickles..and with mangoes, no doubt! I love pickles and this looks tempting ! Love this quick & easy instant pickles. Quick and easy and tasty! !